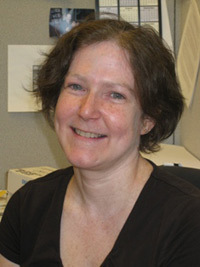 After obtaining her PhD from the Department of Molecular Biophysics and Biochemistry from Yale University, Dr. Julia Pinsonneault began her tenure at The Ohio State University as a postdoctoral researcher studying Drosophila embryos (fruit flies). When funding ran out in 2002, she joined Wolfgang Sadee's lab in the Department of Pharmacology. Looking back, Pinsonneault muses, "When you are trained to do Drosphila research, you always have to keep track of the chromosomes that you are interested in and worry about whether they will recombine. Translating that into haplotypes and positions on a human chromosome was very easy. There are basically 23 chromosomes instead of 4." It was a serendipitous move. Over the past decade, Pinsonneault has been able to work with numerous human cohorts in analyzing genetic susceptibility and drug response to complex diseases. Her focus is central nervous system disorders such as post-partum depression, bipolar disorder, and other disorders affected by the dopamine transporter and estrogen receptor alpha, for example. Clinicians from around the continent send Pinsonneault their cohort samples so that targeted SNPs can be genotyped by restriction fragment length polymorphism (RFLP) analysis and other methods. To find SNPs of interest, Pinsonneault measures RNA allelic expression imbalance and then scans genes for functional polymorphisms. She explains: "If I look at the right polymorphism, there will more likely be clinical associations." After a SNP candidate is associated with an imbalance, researchers can test it in cell culture for function and then genotype it in cohort samples. Once the wet lab work is complete, Pinsonneault uses Golden Helix software for conducting the genetic association. "I've been using HelixTree [a precursor to SNP & Variation Suite] for 10 years; in fact, I was an early beta tester. I haven't really used anything else for genetic analysis." Early on, just after joining Wolfgang's lab, she tried using an open-source haplotype program on a Linux computer. She recounts of the experience: "I'm not a statistician. There are programs statisticians use that may be free, but they're also really hard to use. When I had to learn the Linux program, it was very hard, and it was weeks and weeks of figuring it out." In contrast, Pinsonneault says: "I really like that SVS is very user friendly." Pinsonneault relies on SVS for haplotype and LD detection, dominate and recessive genetic association testing, and comprehensive regression analysis. "It allows me to do my work easily, simply, and very quickly." Through the use of SVS, Pinsonneault has been able to find novel associations that move her research forward. Much of Pinsonneault's research to date centers on rs27072, which she has linked to bipolar disorder. Her findings were recently published in Neuropsychopharmacology, a Nature publication: "Dopamine Transporter Gene Variant Affecting Expression in Human Brain is Associated with Bipolar Disorder. "1 The paper has been cited by five other journal articles in the last few months. Pinsonneault frequently has three to five research projects in the works, which vary in intensity. She will often be conducting genotyping on one cohort, analyzing a different one, and writing a paper on a third. And she shows no sign of slowing down. In 2009, Pinsonneault received a pilot award for research on ADHD in children with autism spectrum disorders, in collaboration with Dr. Michael Aman at The Ohio State University Nisonger Center. They now have 113 subjects which can be tested for association with rs27072, part of the dopamine transporter gene. The dopamine transporter is a drug target for medications for ADHD, and Pinsonneault hypothesizes that rs27072 may be a key to the solution. Pinsonneault says early results look promising. She concludes: "If I didn't have SVS, I'm not quite sure what I'd do." 1 Pinsonneault, J et al. (2011) Dopamine Transporter Gene Variant Affecting Expression in Human Brain is Associated with Bipolar Disorder. Neuropsychopharmacology, 36(8):1644-55, doi:10.1038/npp.2011.45.